All yellow pointing lab litter expected around March 19, 2019. Repeat Breeding. This is a litter that I'm extremely excited about once again because of how well Kirby and Lilly matched up in the first breeding. You won't find a better looking male and female breeding! Pups are bred for a strong natural point, intelligence, drive, athleticism, and the right look! Sire and Dam match up perfectly and will produce a combination of a bird dog with a ton of drive and also a companion that you and your family can take wherever you go. Puppies will come with all the health clearances. Some notables in the pedigree include: 42 different titled dogs, 15 GMPR titles, 11 APLA titles, and 5 APLA Hall of Fame dogs. Pedigree includes some of the most sought after pointing lines in the country: GMPR MPR Rik's Risky Raider MH, GMPR Grits of Black Forest SH, 4xGMPR Cashman’s Super Trooper MH, GMPR Cashman's Risky Raiders Red Dee SH, GMPR Sauk River’s Featherstorm MH, MPR Brewmaster's Jack SH, GMPR Blackwater Lexus, and GMPR Wannamakers Hot Tubb SH just to name a few. EIC/CNM clear and also a 28 month guarantee on hips, elbows, and eyes. Lilly is a 55-60 pound female out of my very last "Belle" litter. She is an athletic freak of nature, and possesses that same look Belle had. I knew with Belle's last litter I wanted something as similar as possible to those traits Belle possessed and she has "it"! The same gorgeous look, athleticism, hard nosed, and will go all day long! Lilly's pedigree is also quite impressive. Some notables include: GMPR MHR Rik's Risky Raider MH, GMPR Grits of Black Forest SH, GMPR, High Sierra Kodi MH, GMPR Blackwater Lexus, GMPR Wannamakers Hot Tubb SH, and Minn Horse and Hunt Club Thor MH to name a few. These are some of the top bloodlines in the pointing and hunt test world! Lilly is a multi-dimensional dog who gives me whatever I need whenever I want it! She can sit out on the water or in the field all day and retrieve ducks, she can bust through the thickest of pheasant cover day in and day out, or she can settle in by my feet at the end of a long day. I just love how diverse she is! She gives me everything I need in one dog. She can hunt waterfowl, pheasant, and sheds with the best of them! Lilly has a BIG BIG motor, but she has an even BIGGER heart and that's what I love most about her! She lives to please, and is type of dog that gives dogs the reputation of "man's best friend". She loves to go wherever I go whether that's bird hunting for the day, hiking through the woods looking for deer sheds, or hopping in the backseat to run some errands! Lilly has an overall great nose, strong marking ability, desire to retrieve, and absolutely loves water! She is the type of dog that is always eager to learn, eager to work, and eager to please! She spends a ton of time in the field every year hunting upland in the Dakotas and Iowa, and water-fowling the "Flyway Highway". Lilly is EIC/CNM clear by parentage, and her OFA and CERF results are to be determined. Kirby is 65 pound male out of Dakota Ridge Kennels. He is an APLA 4xGMPR, AKC MH, has his HRCH title, and has all the looks and drive you are looking for in a Pointing Labrador. Kirby is the type of dog that brings it all to the table! He is an excellent marker, superb blind runner, has an intense point, and is an all-around fantastic companion. 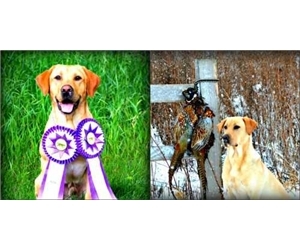 Kirby is considered to be one of the top studs out there as far as an all-around gundog. He excels in everything he does, and whether you are looking for a great hunting companion, a dog that can run hunt tests, or dog that can compete at a high level in the APLA world, Kirby is your guy. He is an exceptional looking male with that classic Raider look to him, and has been successful in everything he has done. Kirby achieved his AKC Master Hunter title going 5 for 5 in his master passes. While obtaining his junior, senior, and master titles Kirby never failed a test. His APLA record is also nearly perfect. Kirby also runs AKC field trials and is a consistent finisher in Qualifying stakes, picking up multiple placements and JAMs. Kirby has a great "off switch". He is a dog that can roll out of bed, go pick up a few limits of ducks and geese, hit the upland fields, then shut it back off and lay in front of the fire place all evening.